This is a busy week for both the Supreme Court and the Privy Council. 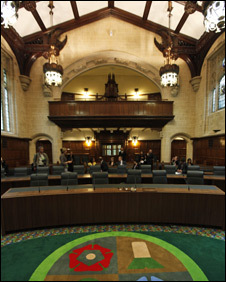 There are two appeals in the Supreme Court beginning with Human Genome Sciences Inc v Eli Lilly and Company to be heard on Monday 18 to Wednesday 20 July 2011 by Lords Hope, Walker, Neuberger, Collins and Clarke. In this IP case, the Supreme Court will decide whether the Court of Appeal erred in failing to apply principles of law established by the European Patent Office, thereby incorrectly concluding that the patent in question was invalid because the specification did not disclose an invention capable of industrial application. The Supreme Court case details are here. A directions hearing will also take place in respect of the conjoined appeals of Lehman Brothers International (Europe) (In Administration) and CRC Credit Fund Ltd and others and Lehman Brothers International (Europe) (In Administration) and CRC Credit Fund Ltd and GLG Investments plc Sub Fund – European Equity Fund on Thursday 21 July 2011 before Lord Walker, Lord Clarke and Lord Dyson. On Wednesday 20 July 2011, the Supreme Court will hand down judgment in R v Smith which was heard on 16 June 2011. It will also publish the judgment in R v Maxwell in which it was decided on 17 November 2010 that this appeal should be dismissed. Publication of the judgment was delayed until the conclusion of the Appellant’s retrial. For further details, please see our post here. There are three appeals to be heard in the Privy Council this week. The first appeal is Ernest Lockhart v The Queen to be heard on Monday 18 July 2011 by Lords Brown, Mance, Kerr, Dyson and Wilson. This is a murder case from the Bahamas which relied on the evidence of seven witnesses, who identified the Appellant by sight or voice as either having been in a dispute with the victim or in the vicinity of the shooting, and an admission from his Co-Defendant before the jury that the appellant had committed murder. The Privy Council is to decide whether the judge erred in imposing the death sentence and in failing to obtain a psychiatric report or to take into account the pre-trial delay; and whether the appellant’s conviction should be quashed owing to inadequate identification evidence. Here are the Privy Council case details. The second Privy Council appeal to be heard on Tuesday 19 July 2011 by Lords Phillips, Brown, Mance, Wilson and Sir Stephen Sedley is Total Mauritius Limited v Mauritius Revenue Authority. The Privy Council will decide the tax status of deposits remitted by customers in respect of the guaranteed return of liquid petroleum gas cylinders to the Appellant. The Privy Council case details are here. Finally, Sharon Investments Limited v Mauritius Revenue Authority is to be heard on Thursday 21 July 2011 also by Lord Phillips, Brown, Mance, Wilson and Sir Stephen Sedley. This is another tax appeal from Mauritius concerning a decision made by the defunct Tax Appeal Tribunal which rejected an appeal by the Appellant against the Respondent’s tax assessment. Post-decision, the Tribunal stated a case which the Appellant viewed as having major defects. As the Tribunal was later abolished, the case stated could not be remitted back for amendments. The Supreme Court of Mauritius dismissed an application for the record of the appeal to the Tribunal to be inserted in the record of the appeal before the Supreme Court of Mauritius. This appeal is against that order of the Supreme Court of Mauritius. Here are the Privy Council details. The Privy Council will also hand down the following judgments on Monday 18 July 2011: Permanent Secretary (Ministry of Foreign Affairs) and Patrick Manning v Feroza Ramjohn, heard 10 – 11 May 2011; The Honourable Prime Minister Mr Patrick Manning, The Public Service v Ganga Persad Kissoon, heard 12 May 2011; and Emile Elias & Company Limited v The Attorney General of Trinidad and Tobago, heard 15 June 2011. Jivraj v Hashwani, heard 6 -7 April 2011. Autoclenz Limited v Belcher and others, heard 11 – 12 May 2011. In the matter of Kaupthing Singer and Friedlander Limited (in administration) and In the matter of the Insolvency Act 1986, heard 13 and 14 July 2011. Leave a reply on "In the Supreme Court w/c 18 July 2011"